Vallejo, 2018 Diamond Gloves New Jersey champion in the 140-pound weight class, won a number of tournaments, both local and national. He has the belts to prove it. Recently, he was recognized at the annual New Jersey Amateur Boxing Association awards banquet in Linden for competitive excellence. His story begins in his last year at Clifton High School. Vallejo said coach Jose Concepcion started asking him to try his hand at boxing. At first, Vallejo brushed him off. But the coach, who saw talent, persisted. Vallejo eventually agreed to give it a shot. Vallejo came in dressed to participate. It took a month of grueling training before trainers at the Jersey Boy Boxing Club let him try his hand at sparring. From that initial experience, Vallejo’s amateur career has blossomed. 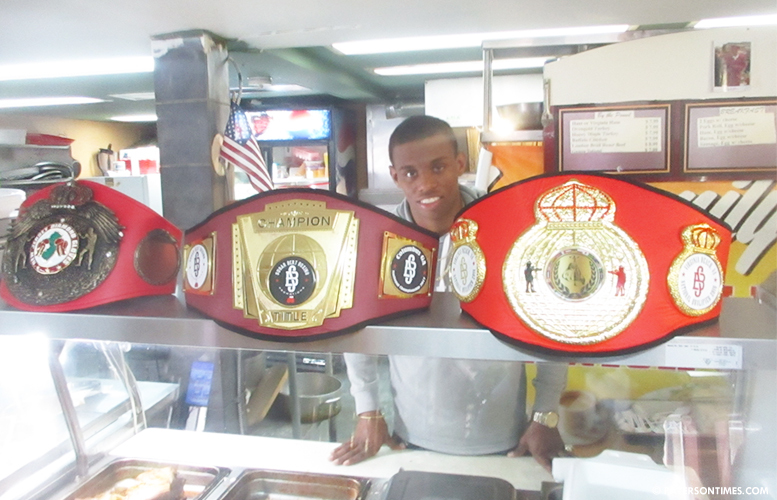 Besides the Golden Gloves success, the young fighter garnered first place finishes in national tournaments by travelling to both Georgia and Virginia. He now sports a 40-2 record. One of his losses was avenged when he topped the previous victor in a rematch. Vallejo now is employed at Team Machine Deli in Woodland Park which is owned by his parents. He said he does everything at the eatery and “even cooks a little bit.” Six days a week, after getting off work in the afternoon, Vallejo heads to Paterson’s True Warriors Boxing and Fitness Club to train. Formerly directed by boxing icon Joe Grier, the gym has produced a number of nationally ranked fighters over the years, including world champion Yuri Foreman who held the WBA super welterweight title from 2009 to 2010. Now under the management of boxing coaches Jose Concepcion and Oscar Suarez, Vallejo described his training routine at True Warriors. He arrives each afternoon a 4 p.m. and leaves at 8 p.m.
Vallejo said he attends the New Life in Christ Church at 446 Market Street in Paterson. Vallejo’s pastor, Rev. Jose LaLuz, stopped in Team Machine Deli on a recent morning. “John calls me before every one of his matches and we pray together,” said LaLuz. The boxer lived half of his life in Paterson. He was born in New York City and raised in the Bronx. When he was 12 years old his family moved to Paterson. Vallejo’s next challenge will be the New Jersey Golden Gloves Tournament in March. State winners move on to participate in national competition. At the New Jersey Amateur Boxing Association awards Vallejo was among some big name boxers. A number of iconic pugilists from the Garden State, including Frankie ‘The Shark’ Toledo, were honored for lifetime achievement at the dinner. Toledo was inducted into the New Jersey Boxing Hall of Fame in 2006. Boxing is a “lonely sport,” said Vallejo.